Create and instantly share markups with your team so everyone is clear and on the same page. 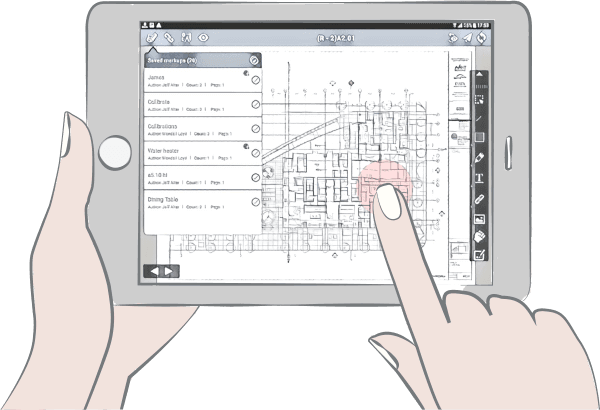 Choose your tool, pick a spot on your drawing and, boom, you’re saving time with markups. No Wi-Fi? No problem, you can make your marks on the go, right in the app. SKYSITE syncs once you’re back online. Do it all here. Make assignments and notes, call attention to issues, add measurements. Provide specifics with links to other docs and info. And, if you change your mind, you can delete a markup right from the device. With SKYSITE, you have an advanced search engine and the OCR environment in the cloud. This worked out well for us. We can target right down to an exact page of the information we’re looking for in the shortest time possible. Since then, I’ve had employees tell me that this new technology saved them lots of time. SKYSITE was the more user-friendly, quick, logical and reliable tool we ultimately selected to use in Palo Alto. We haven’t purchased paper in close to six months now. Bring your markups into the 21st Century. Get SKYSITE today!